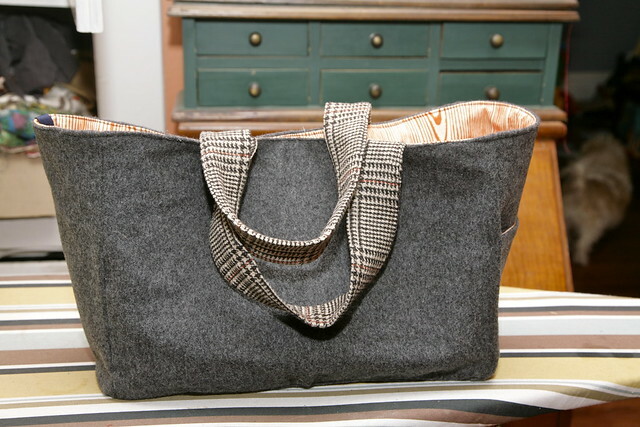 Inder Loves Folk Art: Lotta Jansdotter's All-Day Tote. I was cleaning my sewing area this morning (it does happen, very infrequently) and found an unfinished project, the "All-Day Tote" from Lotta Jansdotter's Simple Sewing. This book has a lovely Scandinavian minimalist aesthetic, and it's a great book for a beginning sewist. The projects really are "simple." 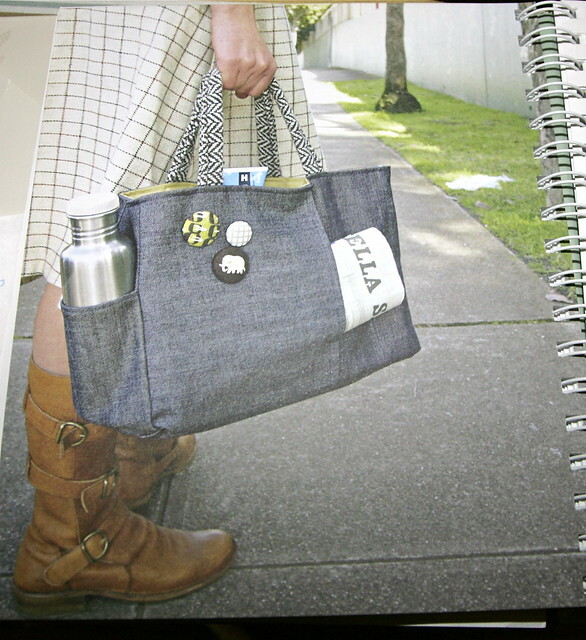 The All-Day Tote is a simple tote bag with a few pockets. I've made it once before, from denim lined in brightly colored vintage tea-towels. Unfortunately, I didn't blog it. Although it didn't turn out perfectly, that was a hard gift to part with! This has caused me serious and lasting regret. Why didn't I buy more? Why? Why didn't I get some in green too? Whyyyyyyyy? For kicks, check out the last project I used this fabric for - Joe was just a little dude! Those were the best pants ever, and I kept putting them on him even when they had turned to "man-pris." But I digress. So anyway, I cut out and interfaced the pieces for this All-Day Tote about a year ago, but then Christmas hit, and I set it aside. It was forgotten for a variety of reasons, including that I found some aspects of the project intimidating, and I think I had a premonition that it wasn't going to be all that I had hoped. Today, cleaning off my sewing table, I carefully packed away some other unfinished projects, but took a second look at this one. Hmmm, I thought, I could just finish this. Right now. And so I did. It was no problem. I don't know why I was intimidated (perhaps I'm a little more confident now than I was a year ago). It only took an hour or two. Here, I tried to recreate the photo in the book. What? The photo in the book was not indoors and in front of a dog crate? Quiet, you. Oh jeez, are those sewing threads still hanging from my cardigan? My blog is totally super polished. It's a fine little tote, if a little bit floppy (and I interfaced the living daylights out of it!). It will be handy for the farmer's market and the library and hauling Joe stuff around. I used a different wool plaid with a bit of orange for the handles. Glamor shot on ironing board. The lining is a bit baggy. I really should go back in there and shave a little bit off the bottom all around. But after languishing on my sewing table for a year, what are the chances? Here, it is holding my reading glasses, keys, wallet, and my current novel, Victor Hugo's Les Miserables. I know, you can't even see that enormous book in there, but it's in there, trust me. Anyway, you know, just the bare essentials. There is room for a lot more. I could fit The Grapes of Wrath and War and Peace in there as well. It has a magnetic closure and a key fob! It's definitely not my best work, but it's fine. I will use it. I'm glad I finally finished it! And it is lined in dreamy orange faux bois! It feels good to finish a project! And it looks great! I remember seeing that pattern in the book and lusting after the bag....yours came out fabulous. I love the wool! 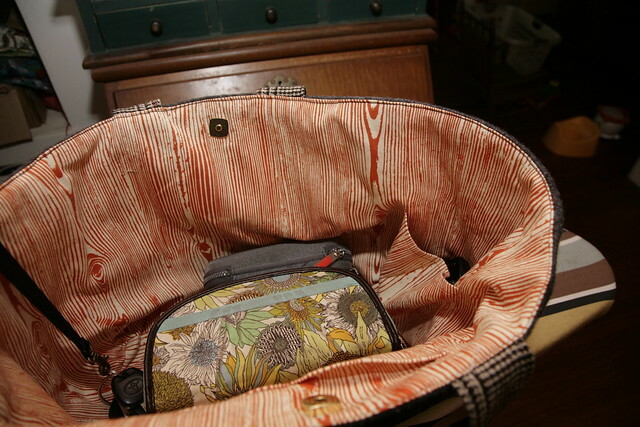 Oh my that lining fabric is insanely fabulous, and fortunately no-one's going to grow out of this bag! Love it. Love your super-styled photo. I often accessorise with sewing threads too and I think there are overlocker thread chains on our driveway and possibly even down the street. woohoo for woodgrain! 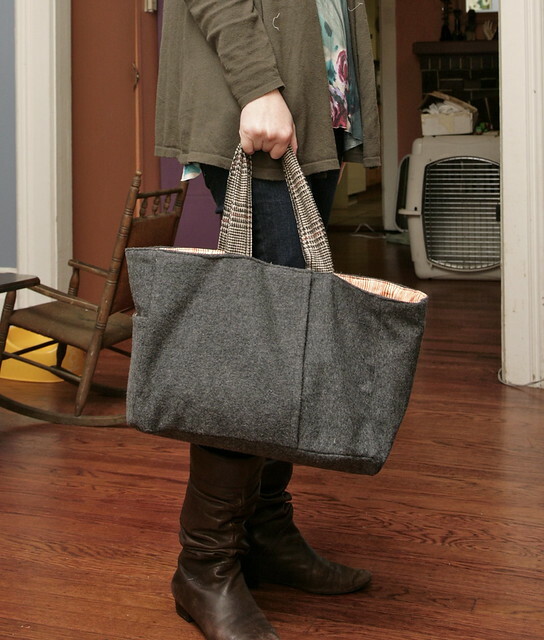 this tote was one of my very first sewing projects - yay for lotta and her simple sewing! it looks great. Thanks everyone! It is a rare and momentous event when my unfinished pile gets smaller rather than larger! I really like it! It's lovely. I was just thinking about how all of our totes are so ugly and (yawn) functional. As in, weird reusable grocery shopping bags. You are much more glamorous than we are. Enjoy the bag. Tote is adorable and I really love your boots!